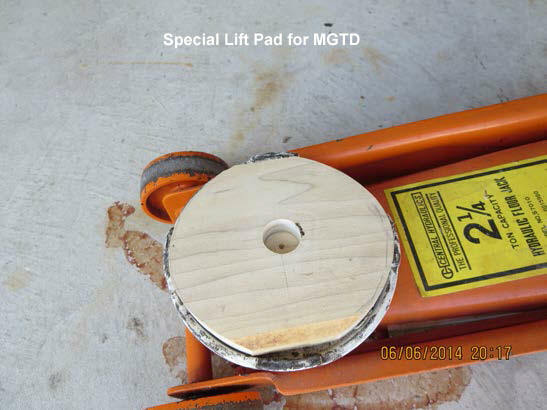 Before I started dismantling the brakes my 1951 MGTD, I made a new wooden insert for the lifting pad of my floor jack last week. The pad I made is of poplar simply because a piece of poplar was within reach of my hand when I started this small project. A few minutes later, after a trip to the band saw, disc sander, and drill press, the insert dropped into the dish of my jack’s lifting pad. Most importantly, I relieved a spot in the center of the pad to receive the drain bolt of my MGTD. This feature spreads the weight of the car across the differential case, avoiding the spot pressure which occurs when is supported on the drain plug. After I put the car on jack stands, I could see the bubbled Imron paint pattern on the frame and pedal box near the master cylinder. 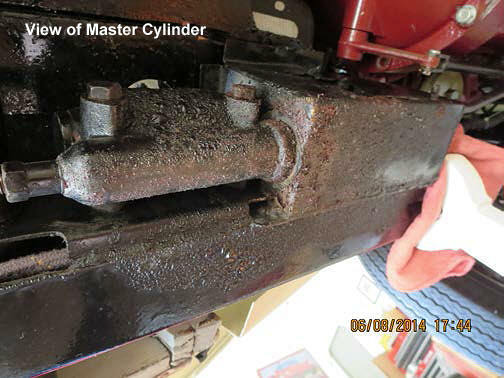 I was pleased that I encountered no difficulty removing the master cylinder. However, as I turned the bolts, I noted the side plate of the pedal box was missing and the box itself was a bit banged up and its top flange was torn. After removing the ‘circlip’ with needle nosed pliers, I put a brief shot of compressed air in the outlet port to push the piston into my hand. The piston should be cleaned and I’ll reuse it if it is not scored. 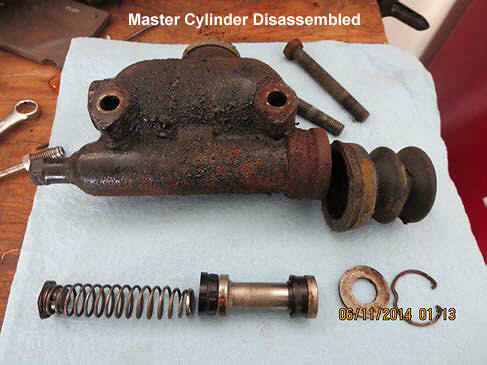 Ah, I found the bore of the master cylinder was potted. Here is the first look inside. This is an excellent illustration of the fact that brake fluid absorbs water, which over time will rust and score the inside of a brake system. 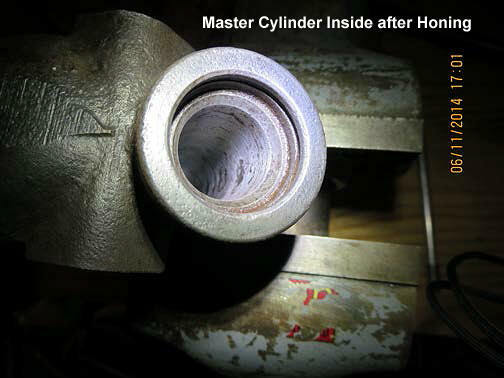 Next, here is a look at the bore after I briefly honed the cylinder. 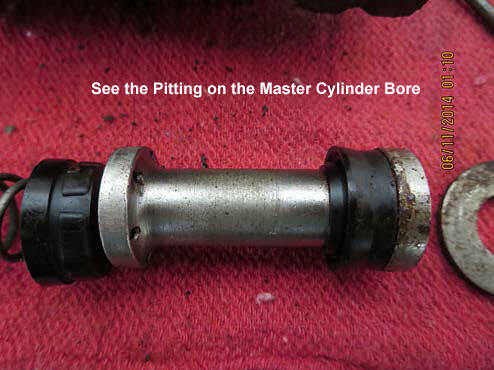 The pitting in the bottom of the bore remains and the cylinder should be sleeved. Apple Hydraulics (www.applehydraulics.com) will sleeve the master cylinder in brass for $95 and completely rebuild them for $175, and sleeve in stainless for $142.50 and completely rebuild with a stainless sleeve for $262. Apple will sleeve wheel cylinders in brass for $50 and completely rebuild them for $85, and sleeve wheel cylinders in stainless for $75 and completely rebuild them with a stainless sleeve for $127.50. 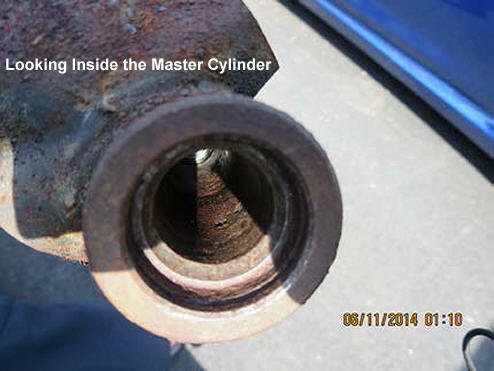 White Post (www.whitepost.com) provides a cylinder rebuilding service using brass sleeves and charges $225 for a master cylinder and $80 for a wheel cylinder. Karp’s (www.karpspb.com) sleeves cylinders with stainless steel and charges $105 for a master cylinder and $69 for wheel cylinders. Mark Frappier (413-789-8665) will sleeve an MG T series master cylinder in stainless steel for $65 and charges $45 for wheel cylinders. Joe Way of Sierra Specialty Automotive, who also did high quality cylinder sleeving work has retired. His web site (www.brakecylinder.com) remains available should you wish to learn more about this subject and see examples of his work.